Crop production in irrigated areas is often negatively affected by salt accumulation and waterlogging. Bearing in mind that only 1,2% of South Africa’s land area is suitable for irrigation, proactive measures need to be taken to prevent further loss of this limited resource. This article evaluates a series of remote sensing and geospatial modelling techniques for identifying waterlogged and salt-affected areas within South African irrigation schemes. Agriculture directly contributes to roughly 2,5% of the gross domestic product (GDP) of South Africa. Through linkages to the manufacturing sector and contribution to employment, the indirect contribution of agriculture is estimated to be as high as 30% [1, 2]. This contribution was highlighted in September 2018 when South Africa officially entered a technical recession, which was mainly ascribed to a 29,2% decrease in agricultural production caused by a drought-enforced decline in field crops and horticultural products . Irrigation – estimated to support between 25 and 30% of national agricultural production – plays a critical part in the production of agricultural outputs, especially high-value export crops. Crop production in irrigated areas is often negatively affected by salt accumulation and waterlogging. Excessive accumulation of salt in the plant root zone has a deteriorating effect on vegetation growth, resulting in reduced crop yield and barren soil, and ultimately leading to a decrease in agricultural production. It has been estimated that 18% of South Africa’s irrigated land is either salt-affected or waterlogged . Salt accumulation and waterlogging are closely linked as rising water tables prevent salts from being leached. Nell et al found that 6,3% of the nine South African irrigation schemes investigated were severely salt-affected . Although this proportion is relatively small compared to the proportion of salt-affected areas in other countries (e.g. Argentina (34%), Egypt (33%), Iran (30%), Pakistan (26%) and the United States of America (23%) ), one should bear in mind that only 1,2% of South Africa’s land area is suitable for irrigation . 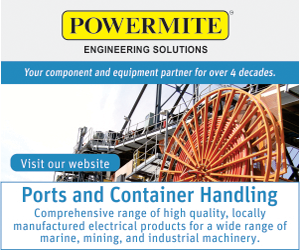 Proactive measures therefore need to be taken to prevent further loss of this limited resource. There is a critical need for active salinity monitoring so that rehabilitation and preventive measures can be implemented. Conventional methods for monitoring salt accumulation within irrigation schemes involve regular field visits to collect soil samples, followed by laboratory analyses. Many field visits are required to monitor large irrigation schemes effectively. According to Nell et al, salt-affected areas in South Africa are relatively small in extent (often as narrow as 1 to 2 m), which further limits the viability of relying on in situ methods . Remote sensing has been proposed as a less time-consuming and more cost-effective method for monitoring salt accumulation, as satellite images cover large areas on a regular, timely basis . A number of direct and indirect earth observation approaches for detecting accumulated salts exists. The main direct indicators of salt accumulation and waterlogging include the detection of halophytic vegetation [9 – 13], visible salt encrustations [12, 14 – 21] and surface ponding , while the indirect approach focus on monitoring physiological stress of vegetation [14, 22 – 28]. Stellenbosch University and the Agricultural Research Council evaluated a series of remote sensing and geospatial modelling techniques for identifying waterlogged and salt-affected areas within South African irrigation schemes [5, 29 – 33]. These studies concluded that the most effective approach is to consider both direct and indirect salinity indicators, especially when salt-affected areas are relatively small. A new technique, called within-field anomaly detection (WFAD), was found to consistently outperform the other techniques evaluated. Essentially, the technique identifies areas within cultivated fields that are consistently under stress (i.e. are anomalies) over several (e.g. three) growing seasons. The assumption is that, if a particular area within a field is stressed over an extensive period, the cause is unlikely to be related to factors such as water stress, lack of fertiliser or disease and that the most likely cause would be related to soil conditions [24, 25, 34]. The principle of the WFAD is to analyse changes in multi-temporal vegetation indices (e.g. 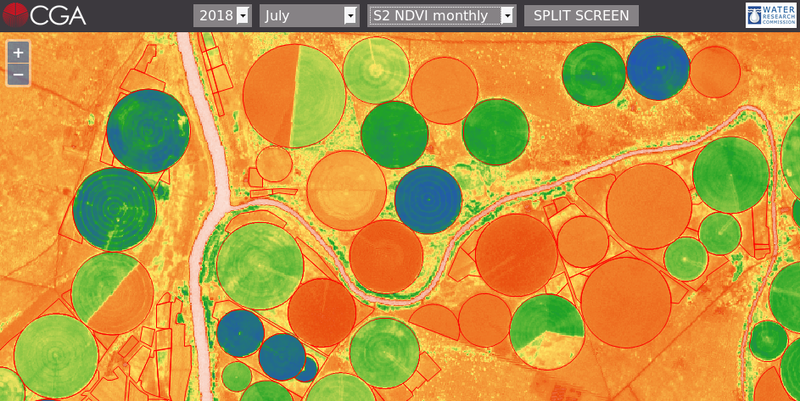 normalised difference vegetation index (NDVI)) and band ratios (e.g. image brightness) derived from high resolution satellite imagery (e.g. WorldView 2/3/4, SPOT 5/6/7, Sentinel-2) to accommodate both the direct and indirect indicators of salt accumulation and waterlogging. fields are not covered by vegetation throughout the season. These variations make the identification of stressed areas very difficult, particularly if the multi-season satellite images are not acquired at exactly the same period in the growth cycle of a particular crop. The WFAD circumvents these complications by only considering relative biomass or soil brightness variations (as represented by the vegetation/brightness indices) within each individual field. If a particular area within a field has a relatively low biomass or high brightness compared to the rest of the field, it is flagged as an anomaly. This process is repeated on historical imagery (acquired as close as possible to when maximum growth can be expected) to identify areas that are consistently stressed. The WFAD was compared to hundreds of in situ soil samples collected in nine irrigation schemes throughout South Africa as part of a published WRC project (report TT 648/15). The selected schemes represented varying climatic, environmental and agricultural conditions (e.g. crop types and farming practices) to effectively evaluate the WFAD’s accuracy and robustness. Overall, salinity and/or waterlogging detection accuracies of 75% (0,6 kappa) was achieved. Most of the misclassifications were related to other soil conditions (e.g. compaction and rocks), which demonstrated the robustness and transferability of the approach, as well as its value as a scoping mechanism to identify soil-related problems in irrigated fields. It was concluded that the approach holds potential for operational implementations, but that more work was needed to streamline and automate the process so that it can be used for routine monitoring. A follow-up WRC project was consequently initiated to develop an operational earth observation tool for the proactive management of salt accumulation and waterlogging. The purpose of this “technology transfer” project is to make the detected anomalies available to all stakeholders (farmers, extension officers and agribusinesses) in a timely and cost-effective manner. The project team consists of researchers from Stellenbosch University and agronomists of GWK’s (www.gwk.co.za) precision farming division. This article aims to provide an overview of the resulting web-based salt accumulation and waterlogging monitoring system (SAWMS) and comments on how the system can be used to increase agricultural production in irrigated areas. The original WFAD technique was based on a multi-temporal expert system classification implemented on SPOT 5 imagery in a geographical object-based image analysis (GEOBIA) paradigm . Given that SPOT 5 imagery is no longer available (the satellite was decommissioned in 2015), the WFAD method was modified to make use of freely-available, multi-temporal Sentinel-2 imagery. The SAWMS automatically downloads the imagery and creates the necessary informative layers (specific vegetation and brightness indices) required to identify salt-affected or waterlogged areas (anomalies). Fig. 1: An example of identifying anomalies within a vegetated field, the first part of the SAWMS workflow. Part one of the SAWMS workflow combines a vector layer (field boundaries) with the processed satellite images (vegetation indices and band ratios) to produce an anomaly layer per time-step (single image). 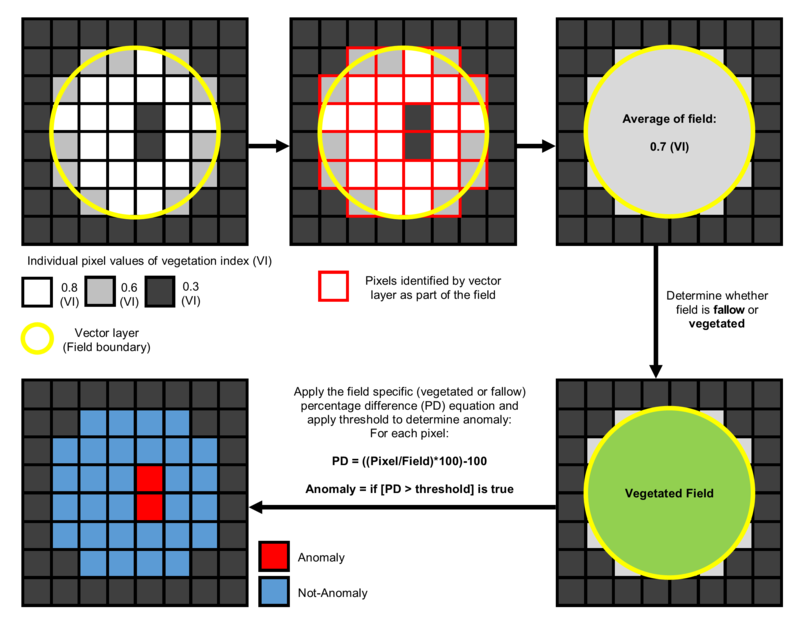 During this process, each field is classified as being either vegetated or fallow, which then determines the appropriate algorithm and specific percentage difference threshold value to be used for identifying anomalies within the specific field (Fig. 1). The algorithm and threshold values are specifically developed to account for the various indicators of salt accumulation and waterlogging for both vegetated and fallow fields. This pixel level process is applied to each individual field and forms the foundation of SAWMS’s relative (within-field) approach. Fig. 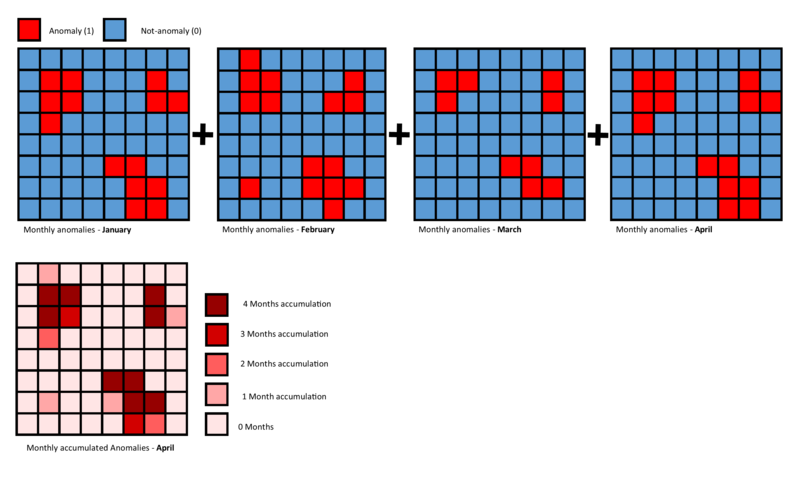 2: An example of the binary multiplication process to produce monthly anomaly rasters, the second part of the SAWMS workflow. The second part of the SAWMS workflow combines all the individual anomaly layers (one per time-step) created during the preceding module. A process of binary multiplication on a monthly time scale is used for this purpose (Fig. 2). Each month can have up to six single anomaly layers. Assuming that salt-affected or waterlogged areas will persist during a month, most areas falsely identified as being anomalies within a single anomaly layer is removed at this stage. Fig. 3: How an anomaly heat map is calculated for a four-month period as the final part of the SAWMS workflow. During the third and final part of the SAWMS workflow, an additional multi-temporal dimension (long term) is added by aggregating monthly anomalies for a specified number of preceding months (Fig. 3). The result is a monthly accumulated anomaly layer or, an anomaly heat map, in which areas with higher values are more likely to be salt affected or waterlogged. The anomaly heat map is the final product of SAWMS and is presented on the web-based platform for a rolling six-month period. The biggest limitation of the SAWMS is its dependence on a field boundary vector layer. Currently, the system makes use of field boundaries supplied by the Crop Estimates Consortium . This dataset was released in 2017, but was digitised from historical imagery (2013–2015) and as such is not a good representation of the current situation. 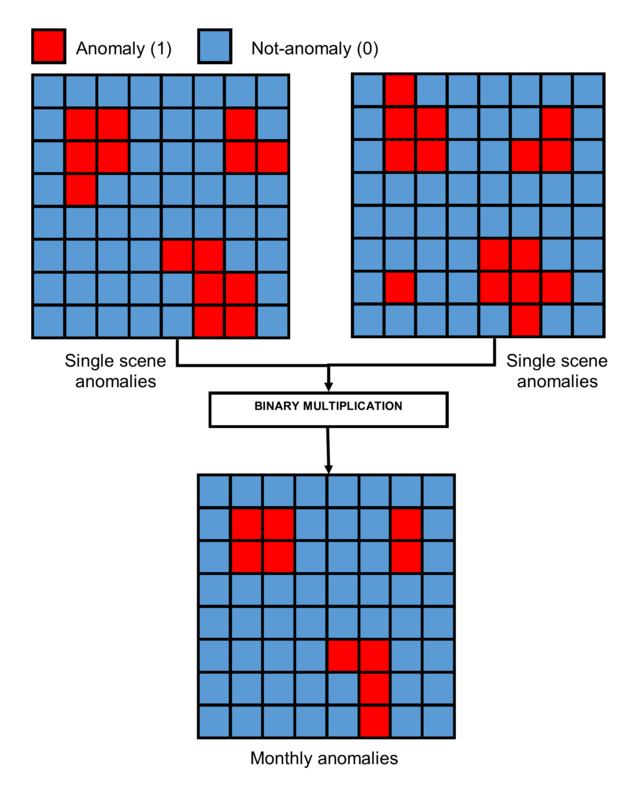 False-positive anomalies are produced if the vector layer does not accurately define the boundary of a field. Research, funded by the WRC, is currently being carried out at Stellenbosch University to automatically delineate field boundaries from multi-temporal Sentinel-2 imagery. Once completed, the resulting field boundaries will be incorporated into the SAWMS workflow. This will ensure that the boundaries relate to the most recent imagery, which should substantially reduce false-positive anomalies. Through engagement with potential users, it was determined that a web-based platform was the most sensible means through which the anomaly maps can be disseminated, particularly given that the anomaly maps are updated on a monthly basis. Fig. 4: Field boundaries viewable when zoomed in to an area of interest. The SAWMS currently has a straightforward GUI that makes use of three dropdown menus. One menu controls the active layers (NGI aerial imagery, topographical maps, OpenStreetMap, monthly Sentinel-2 true-colour and NDVI and the affected areas layer). The other two menus (year and month) control the date of the anomalies and the Sentinel-2 background layers. 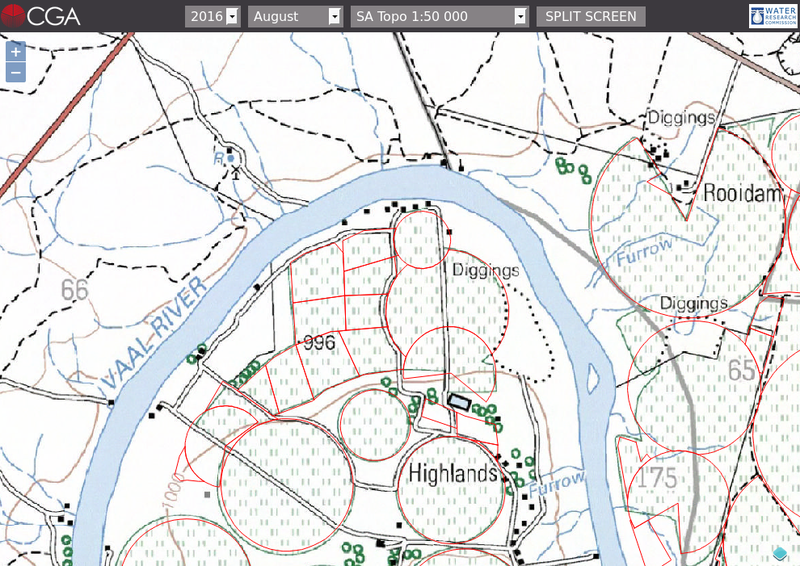 When loading, the GUI shows the extent of the pilot area (the irrigated areas around Douglas and Upington) with OpenStreetMap as the background. OpenStreetMap, as the initial backdrop, allows the user to orientate themselves by the towns, roads and rivers in the display. Field outlines become visible when the user zooms into an area of interest beyond a certain scale (Fig. 4). Fig. 5: True colour Sentinel-2 imagery for July 2017. 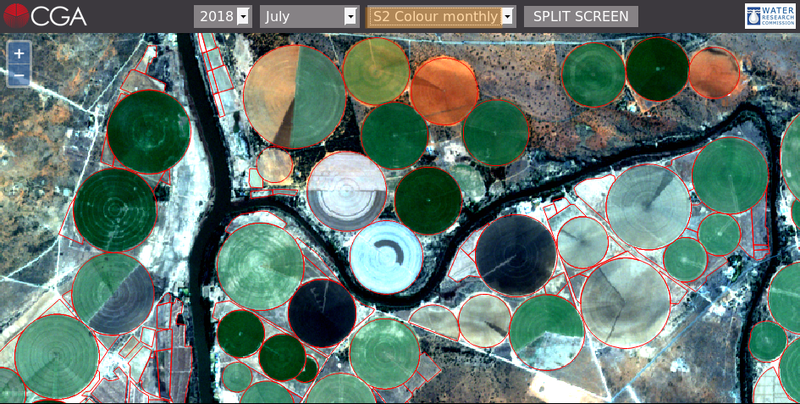 The user has the option to change the background to composite Sentinel-2 images for a selected month. Fig. 5 shows the web application interface with the Sentinel-2 true-colour composite in the background. Fig. 6: Sentinel-2 NDVI layer for July 2017. Fig. 6: Sentinel-2 NDVI layer for July 2017.Monthly NDVI composite images generated from Sentinel-2 imagery can also be viewed (Fig. 6), or the user can choose to view the anomalies for the specified month (Fig. 7). A different date can be selected in the dropdown boxes at the top of the screen. Fig. 7: Anomaly layer for July 2017. A split screen function is provided to allow direct comparison of anomalies to the Sentinel-2 true-colour or NDVI composites (Fig. 8). When this mode is selected, a new set of dropdown boxes (one for each map) appears. The dates shown in each viewer can be linked (should the user wish to change both maps concurrently) or different months can be compared. Fig. 8: The screen can be split in two for side-by-side viewing and comparison. The “merge screen” button returns the viewer to one map screen (Fig. 9). Fig. 9: Merging the split screen. Another viewable backdrop is the NGI aerials layer (Fig. 10), which can be useful when certain features on the Sentinel-2 imagery are unclear. 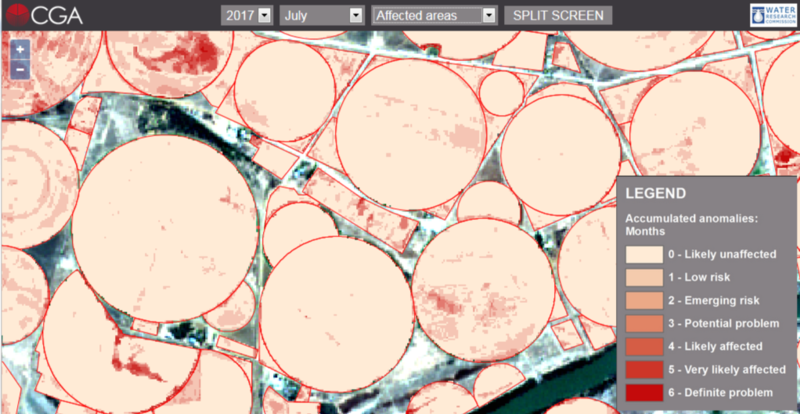 However, users should keep in mind that the aerial photographs can be several years older than the Sentinel-2 imagery. A mosaic of NGI’s 1:50 000 topographical maps is also provided for context (Fig. 11). Fig. 11: NGI topographical maps. The SAWMS is currently being evaluated by agronomists throughout South Africa. Initial feedback suggests that the system is extremely useful, not only for identifying salt-affected and waterlogged areas, but also for flagging areas within cultivated fields that are consistently performing poorly. In most cases, these underperforming management zones are either directly related to salinity and/or waterlogging or can be ascribed to other soil conditions. The negative effects of these long-term anomalies are often too subtle to notice during in-field inspections alone, but are successfully emphasized by the WFAD method. These areas must, however, still be inspected in-field (in situ) to identify the cause of the problem and to determine the appropriate management action (if any). The SAWMS should therefore not be thought of as a means to replace field visits, but rather as an aid for prioritizing field visits. The SAWMS also helps agronomists and advisors to communicate problems to producers. In particular, the ability to view historical satellite imagery and anomaly maps of a particular field can support motivations for remedial actions. The SAWMS is presently freely available on the internet (https://sungis10.stb.sun.ac.za/sawms) and, under the direction of the WRC, is currently being extended to several other regions throughout South Africa. Although the system focusses on irrigated areas, many rainfed fields are also included. The intention is to extend the system to all agricultural areas in South Africa, but this will greatly depend on feedback received from the agricultural community about the system’s potential to help increase production and stimulate South Africa’s agricultural economy. This work forms part of a project titled Salt Accumulation and Waterlogging Monitoring System (SAWMS) Development which was initiated and funded by the Water Research Commission (WRC) of South Africa (contract number K5/2558//4). More information about this project is available in the 2016/2017 WRC Knowledge Review (ISBN 978-1-4312-0912-5) available at www.wrc.org.za. T Fenyes and N Meyer, 2003. Structure and production in South African agriculture. In Nieuwoudt L & Groenewald J (eds) Agriculture in the National Economy, 21-45. Pietermaritzburg: University of Natal Press. J Greyling, 2015. A look at the contribution of the agricultural sector to the South African economy [online]. Grain SA. Available from http://www.grainsa.co.za/a-look-at-the-contribution-of-the-agricultural-sector-to-the-south-african-economy [Accessed 8 March 2018]. fin24 2018. 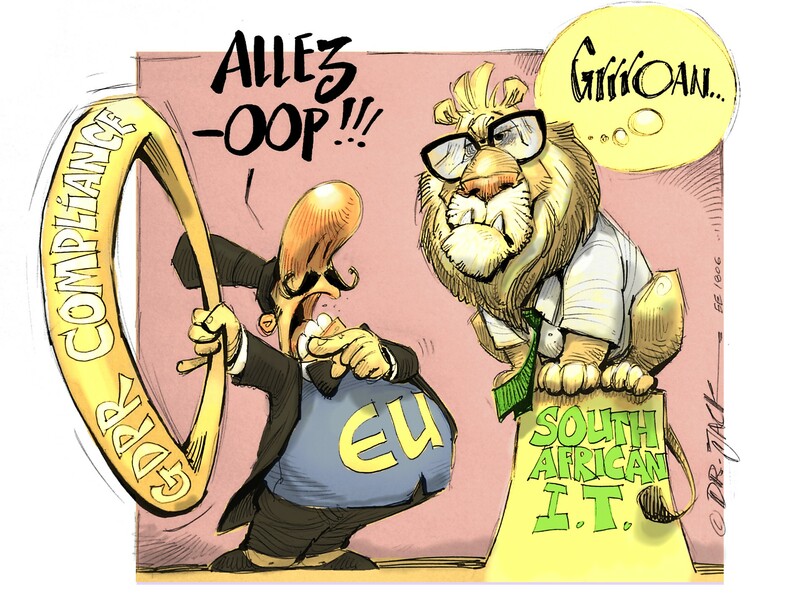 SA in technical recession as second quarter GDP falls [online]. Available from: https://www.fin24.com/Economy/sa-in-technical-recession-as-second-quarter-gdp-falls-20180904[Accessed 30 October 2018]. GR Backeberg, TJ Bembridge, ATP Bennie, JA Groenewald, PS Hammers, RA Pullen and H Thompson, 1996. Policy proposal for irrigated agriculture in South Africa. KV 96/96. Pretoria: Water Research Commission. JP Nell, A Van Niekerk, S Muller, D Vermeulen, T Pauw, GR Stephenson and JN Kemp, 2015. Methodology for monitoring waterlogging and salt accumulation on selected irrigation schemes in South Africa. Report No. TT 648/15. Pretoria: Water Research Commission. F Ghassemi, AJ Jakeman and HA Nix, 1995. Salinisation of land and water resources: human causes, extent, management and case studies. Wallingford: CAB International. FAO 1995. Land and water integration and river basin management. Proceedings of an FAO Informal Workshop, Rome, Italy. A Abbas, S Khan, N Hussain, MA Hanjra and S Akbar, 2013. Characterizing soil salinity in irrigated agriculture using a remote sensing approach. Physics and Chemistry of the Earth 56–57: 43–52. RL Dehaan and GR Taylor, 2002. Field-derived spectra of salinized soils and vegetation as indicators of irrigation-induced soil salinization. Remote Sensing of Environment 80, 3: 406–417. RL Dehaan and GR Taylor, 2003. Image-derived spectral endmembers as indicators of salinisation. International Journal of Remote Sensing 24, 4: 775–794. A Dutkiewicz, M Lewis and B Ostendorf, 2009. Evaluation and comparison of hyperspectral imagery for mapping surface symptoms of dryland salinity. International Journal of Remote Sensing 30, 3: 693–719. AA Elnaggar and JS Noller, 2010. Application of remote-sensing data and decision-tree analysis to mapping salt-affected soils over large areas. Remote Sensing 2, 1: 151–165. P García Rodríguez, ME Pérez González and A Guerra Zaballos, 2007. Mapping of salt-affected soils using TM images. International Journal of Remote Sensing 28, 12: 2713–2722. S Abood, A Maclean and M Falkowski, 2011. Soil Salinity Detection in the Mesopotamian Agricultural Plain Utilizing WorldView-2 Imagery. RS Dwivedi and K Sreenivas, 1998. Delineation of salt-affected soils and waterlogged areas in the Indo-Gangetic plains using IRS-1C LISS-III data. International Journal of Remote Sensing 19, 14: 2739–2751. F Iqbal, 2011. Detection of salt affected soil in rice-wheat area using satellite image. African Journal of Agriculture Research 6, 21: 4973–4982. NM Khan, VV Rastoskuev, Y Sato and S Shiozawa, 2005. Assessment of hydrosaline land degradation by using a simple approach of remote sensing indicators. Agricultural Water Management 77, 1–3: 96–109. GI Metternicht and JA Zinck, 2003. Remote sensing of soil salinity: Potentials and constraints. Remote Sensing of Environment 85, 1: 1–20. BRM Rao, TR Sankar, RS Dwivedi, SS Thammappa and L Venkataratnam, 1995. Spectral behaviour of salt-affected soils. International Journal of Remote Sensing 16, 12: 2125–2136. R Setia, M Lewis, P Marschner, R Raja Segaran, D Summers and D Chittleborough, 2013. 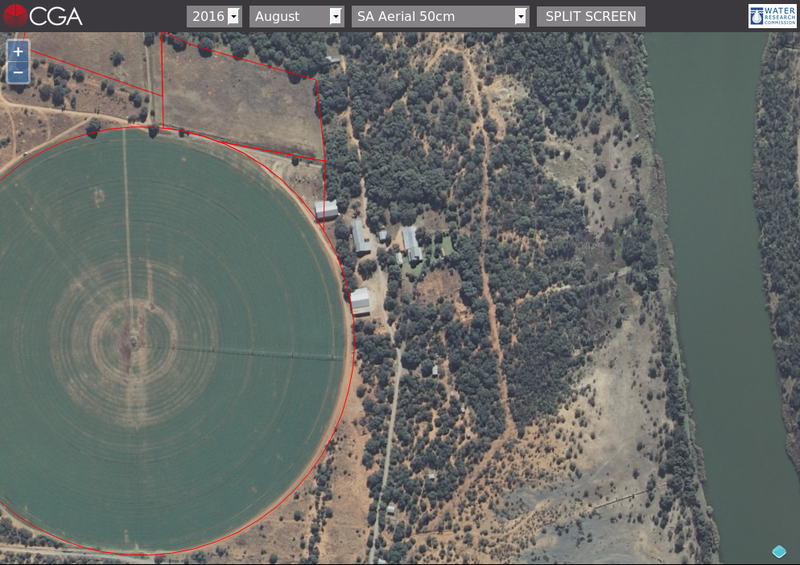 Severity of salinity accurately detected and classified on a paddock scale with high resolution multispectral satellite imagery. Land Degradation and Development 24, 4: 375–384. A Sidike, S Zhao and Y Wen, 2014. Estimating soil salinity in Pingluo County of China using QuickBird data and soil reflectance spectra. International Journal of Applied Earth Observation and Geoinformation 26: 156–175. N Fernández-Buces, C Siebe, S Cram and JL Palacio, 2006. Mapping soil salinity using a combined spectral response index for bare soil and vegetation: A case study in the former lake Texcoco, Mexico. Journal of Arid Environments 65, 4: 644–667. AK Koshal, 2010. Indices Based Salinity Areas Detection Through Remote Sensing & GIS in Parts of South West Punjab. 13th Annual International Conference and Exibition on Geospatial Information Technology and Applications. Gurgaon: 1–11. MP Lenney, CE Woodcock, JB Collins and H Hamdi, 1996. The status of agricultural lands in Egypt: The use of multitemporal NDVI features derived from landsat TM. Remote Sensing of Environment 56, 1: 8–20. DB Lobell, SM Lesch, DL Corwin, MG Ulmer, KA Anderson, DJ Potts, JA Doolittle, MR Matos and MJ Baltes, 2010. Regional-scale assessment of soil salinity in the Red River Valley using multi-year MODIS EVI and NDVI. Journal of environmental quality 39, 1: 35–41. J Peñuelas, R Isla, I Filella and JL Araus, 1997. Visible and near-infrared reflectance assessment of salinity effects on barley. Crop Science 37, 1: 198–202. C Wiegand, J Rhoades, D Escobar and J Everitt, 1994. Photographic and videographic observations for determining and mapping the response of cotton to soil salinity. Remote Sensing of Environment 49, 3: 212–223. TT Zhang, SL Zeng, Y Gao, ZT Ouyang, B Li, CM Fang and B Zhao, 2011. Using hyperspectral vegetation indices as a proxy to monitor soil salinity. Ecological Indicators 11, 6: 1552–1562. SJ Muller and A Van Niekerk, 2016b. Identification of WorldView-2 spectral and spatial factors in detecting salt accumulation in cultivated fields. Geoderma 273: 1–11. S Furby, J Wallace, P Caccetta and G Wheaton, 1995. Detecting and monitoring salt-affected land.